Frederick, Maryland – Philippine Ambassador Jose Manuel “Babe” Romualdez, in partnership with the US-Philippines Society, made a working visit to Frederick, MD, where he met with the mayor and community leaders, and explored business and cultural exchange opportunities, August 1. 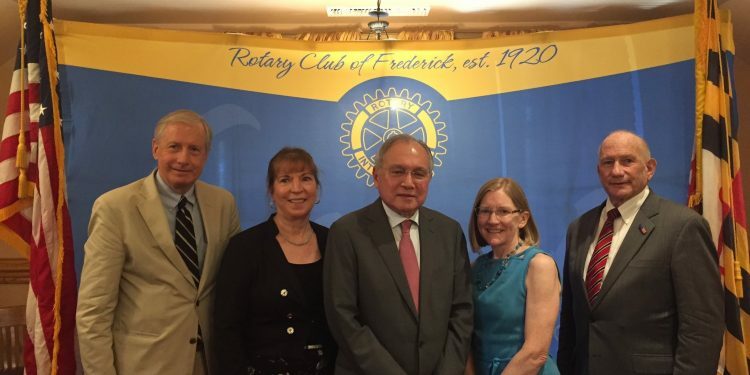 Centerpiece of his “diplomatic outreach” mission was a speech at the Frederick Rotary Club attracting an audience of more than 100 and calling attention to the shared history of the Philippines and the United States. With family roots in Leyte Province, the ambassador referenced General MacArthur’s 1944 Leyte Landing that led to Philippine liberation and independence. The ambassador related his own role more recently in fostering bilateral cooperation on disaster relief after Typhoon Haiyan hit Leyte with such destructive force in 2013. Ambassador Romualdez stimulated audience interest in the Philippines and drew questions ranging from South China Sea disputes to the Philippine position on climate change during a Q/A session. 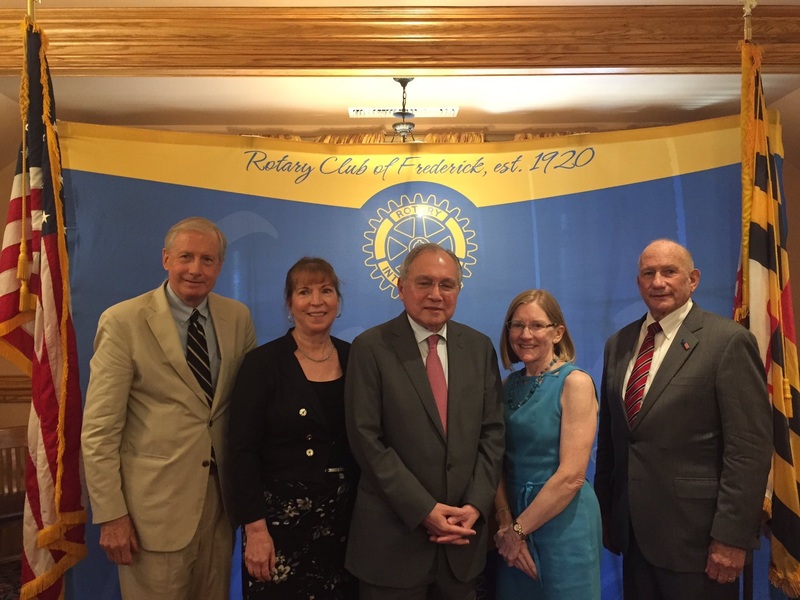 As a fellow Rotarian, the ambassador bonded well with counterparts in the Frederick Rotary Club that included business and civic leaders. 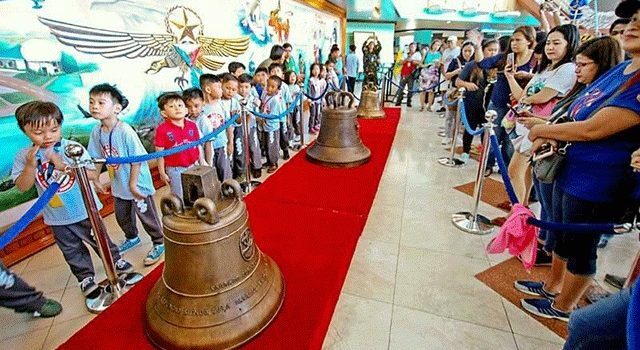 He congratulated the Frederick club for marking its 98th anniversary this year, and noted that the Manila Rotary Club is currently celebrating the 100th year of its founding – yet another example of enduring civic ties between the two countries and peoples. 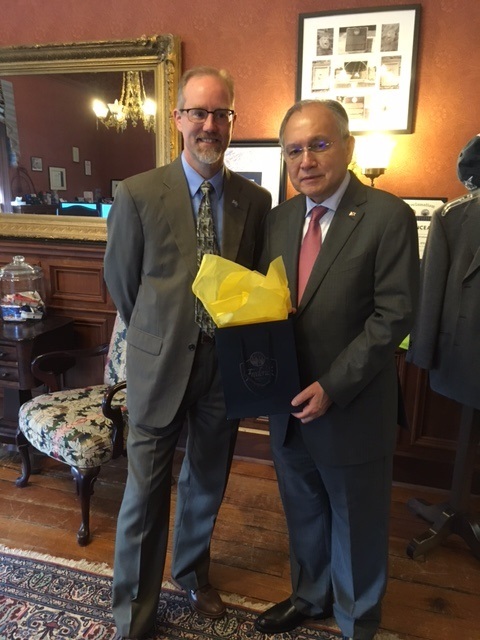 Frederick City Tourism Director John Fieseler gives Ambassador Romualdez an Orientation at the Visitor Center, Frederick, Maryland. 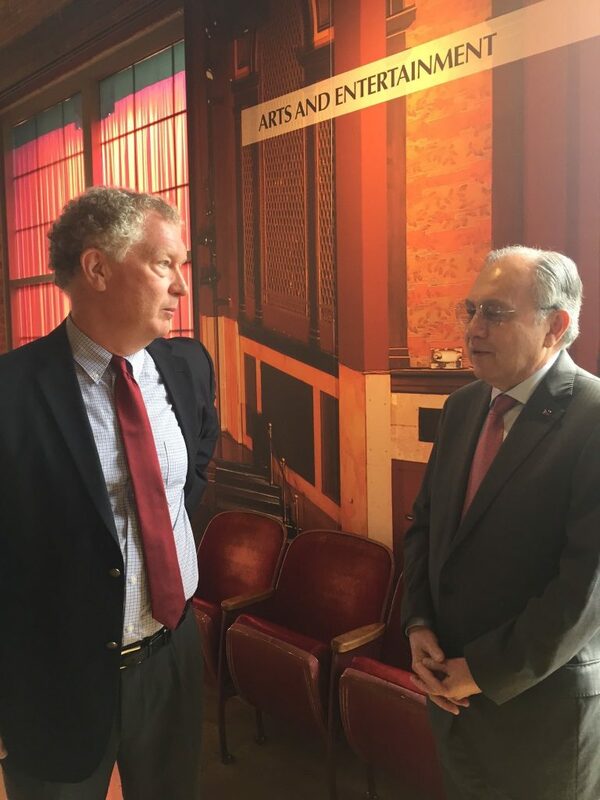 In addition to his call on Mayor Michael O’Connor and a visit to Frederick’s office of Economic Development with the Embassy’s Economic Minister J.V. Chan-Gonzaga, the ambassador toured Frederick’s extensive downtown flood control project that paved the way for a revitalization of the city’s historic district. 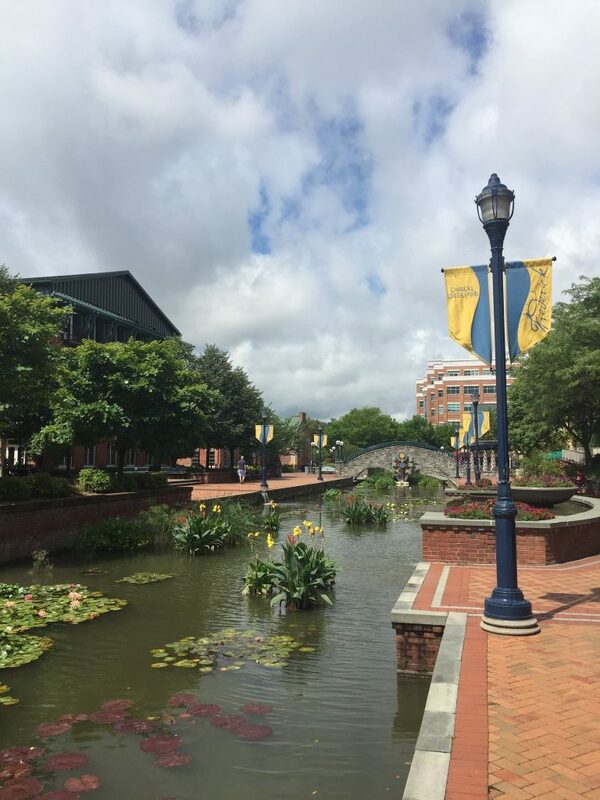 Frederick, with its proximity to Washington, D.C., counts itself as Maryland’s second largest city and touts its attractiveness as a technology center along the I-270 Corridor, and as a tourist destination with recreational activities, colonial and Civil War history. The city has moved well beyond reliance on agriculture and light manufacturing, and has emerged with a modern services and knowledge-based economy that welcomes global partners. As an example of that transformation, local officials pointed to a former cannery building near the Visitors Center toured by the ambassador that now houses an international cyber security company. 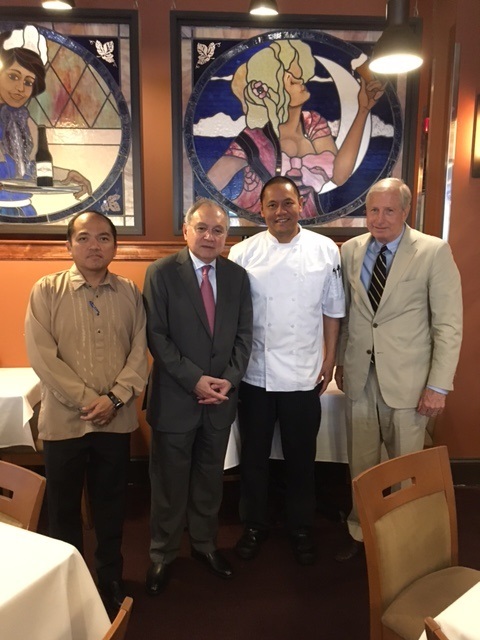 Ambassador Romualdez also met with members of Frederick’s Fil-Am community, including Joseph Canlas, the executive chef at Brewer’s Alley, Frederick’s most popular restaurant. Filipino sports fans will recall that Canlas was a basketball star at Ateneo de Manila University during the 1980’s and is a member of the Ateneo Sports Hall of Fame. He now pursues his “second love” in the culinary arts and enjoys living and working in Frederick with his Canadian-born wife and family. Naturally, the conversation with the ambassador and the chef centered on basketball memories and good food – a nice way to end a successful day of “outreach” beyond the D.C. Beltway! Joaquin Miguel Elizalde (1896-1965), former Resident Commissioner and first Ambassador to the United States, enjoyed visiting Frederick County, where he owned a farm. Ambassador Elizalde, who died in 1965, was interred at Saint Josephs Carrollton Manor Cemetery just south of Frederick. Learn more about Joaquin Elizalde. Frederick City Carroll Creek Park flood control project led to revitalization of the historic downtown area in the 1970’s.